“I have a tough life,” my five-year-old cousin said. “Really? Why is that?” I asked. Later that day my cousin’s complaint made me wonder: How often does God smile down at usand say, “Everything is going to be all right, my child”? that, since we are citizens of heaven, our problems on earth are only for a season (Philippians 3:20). that God works out everything—even tough situations—for the good of those who love Him (Romans 8:28). that we can trust God with our lives (Psalm 55:22). When trouble hits, we tend to see only challenges. So, how can we get a fresh perspective on life when discouragement is weighing us down? 1) Determine if the cause of discouragement is worth being discouraged about. First, I ask myself: Am I upset about something important or something trivial? Often a long line at the supermarket or a rude stranger can put a damper on the entire day. But are those worth being upset about? 2) Determine if the loss is imagined or real. Frequently I’m only upset because of my own “what if…” thoughts: What if she thinks this? What if they do that? What if I don’t do well? What if they don’t like it? When “what ifs” or imagined thoughts weigh you down, ask God to help you take those thoughts captive (2 Corinthians 10:5). Choose instead to dwell on “whatever is true, whatever is noble, whatever is right, whatever is pure, whatever is lovely, whatever is admirable—if anything is excellent or praiseworthy—think about such things” (Philippians 4:8). 3) Talk to the right people about the problem. In 1 Samuel we find the story of Hannah, a woman deeply grieved because she was unable to have children. In her sorrow, Hannah cried out to the Lord for comfort. She went to the temple year after year to pray, and the Lord heard her prayers and opened her womb. Her story is an excellent reminder that we should, first of all, talk to God about our sorrows. “Cast all your anxieties upon Him because He cares for you” (1 Peter 5:7). We can also dialog with encouraging Christians who will speak God’s truth into our lives. However, we need to be careful when selecting these confidants. Discussing the matter with those unable to provide wise advice doesn’t help us. It may even deepen our discouragement or spread it to others. 4) Dive into the Word. God’s truth is the best defense against Satan’s schemes. Several years ago I had two stress fractures which kept me from being active. It put my hobbies—and career—on the line. Needless to say, I was very discouraged. But during that time I dove into the Bible and, in the depths of my sadness, He spoke to me in deeper ways than I had ever experienced. The trial didn’t disappear, but God’s Scriptures lifted me out of the valley of discouragement. It empowered me to endure the trial with contentment and peace instead of depression and bitterness. Sometimes our lows in life are what bring us closest to God. Don’t miss the opportunity by pushing away from God; run to the open pages of the Word! 5) Pour into others. I once heard someone say that it’s better to live life giving away than pulling away. Giving to those in need reminds us of what we have to be thankful for. So, visit a lonely person. Help an elderly neighbor with their yard work. Write a letter to someone who needs cheering up. Are there children at your church that need a mentor? Take the opportunity to disciple them and point them to the Lord. The more you serve, the more you’ll find that your perspective change from gloominess to thankfulness. “First, He brought me here; it is by His will I am in this strait place: in that fact I will rest. Next, He will keep me here in His love, and give me grace to behave as His child. Then, he will make the trial a blessing, teaching me the lessons He intends me to learn, and working in me the grace He means to bestow. Last, in His good time He can bring me out again—how and when He knows. No matter what your trial, God will see you through it. “Trust in Him at all times, you people; pour out your hearts to Him, for God is our refuge” (Psalm 62:8). Felicia Alvarez lives in Southern California and loves avocados, sunshine, and serving her Savior. Currently, she teaches dance to over one hundred students and is working on her second book. Connect with Felicia on her blog or Facebook—she would love to hear from you. Two Cans and a String. And she was in bitterness of soul, and prayed to the LORD and wept in anguish. Remember playing with two cans and a string? The science behind that children’s toy really works. When you take two cans or paper cups, punch holes in the bottom of them, and stretch a string between them, you’ve recreated a primitive phone. The sound of your voice vibrates the bottom of the cup at 1,000 times a second, and the vibrations run along the string, making the bottom of the second cup vibrate with sound waves. The early telephones worked the same way, except the wires were electric. Whenever we pray, God is on the other end of the line with His ear to the cup, hearing every word and listening to every vibration of our voices. He hears even the faintest sigh. The prophet Daniel prayed regularly all his life and history was changed. The apostle Paul prayed, and cities were opened to the Gospel. Hannah prayed and God lifted her burden. If you’re in anguish or distress, you don’t need two cans and a string. Two bent knees and a broken heart will do just fine. Those persons who know the deep peace of God, the unfathomable peace that passeth all understanding, are always men and women of much prayer. How You Are To Win. A Year Later, Ron Luce Looks Back on Daughter’s Deadly Plane Crash. One year ago, the lives of five families went into chaos. The people who loved, raised and cherished Austin Anderson, Stephen Luth, Garrett Coble, Luke Sheets and my own Hannah were shaken to the very core when we learned that the five of them had been in a plane crash in Kansas. Why would God allow such a seemingly senseless tragedy? Why would He allow these four young men, who were passionate about serving Him, to die? Why would He allow my daughter to endure such pain physically, emotionally and mentally? We’re not alone in that question. Every day, day after day, year after year, many good people experience tragedies. Trying to resolve that question initially, and presently, has led to a few discoveries that I want to share with you today. First of all, instead of focusing on what I don’t know (“I don’t know why this happened, it doesn’t make sense to me, I don’t like it”), I focus on what I do know: I know God is good. I know He loves me. I know He sent His son Jesus to die. I know Jesus rose again, and I know Jesus is coming back again one day. Somehow, focusing on what I do know assuages the lingering pain of what I don’t know. Second, God is a mystery. We certainly understand a lot, since He sent His Son, Jesus, to show us what He’s like. We have His Word that describes His nature. But we still “see through a glass dimly.” We don’t understand everything. God is not a formula. God is not completely figured out by any one person. I realize that in spite of the fact that these circumstances violated some of my theology, I enjoy the fact that there’s a mysterious side of God, because I know His underlying nature. Third, I discovered a lot more dependence on Jesus. I leaned on Him when I did not know what to say to Hannah during the hard times of her recovery, when I did not know what to say to these families, as I tried to bring them some resolution and peace about this tragedy. Finally, I discovered all over again that we’re not alone. It seems as though senseless tragedies have happened since the beginning of our Christian faith, from the time when Christians were being lit on fire by Nero, to those who were thrown to the lions in the stadiums, to those even today who are martyred for their faith as they go to share the gospel in a jungle somewhere, like Jim Elliot. It seems that, whether heroic or accidental or the result of persecution, good people perish. We still don’t understand why, but we’re in good company. I know that a lot of people will try to offer explanations, with good intentions and theology. I understand wanting desperately to find the good in such a terrible situation. But I know that there are a lot of people who experience tragedy and may never understand why. Still, they stand strong in their faith. So must we. Today we are doing more than simply celebrating Motherhood, we’re considering Mothers Worth Imitating. There was a little girl who was about to say her part in a children’s program at church. As she got into her place on stage and saw the large crowd, she panicked. Those lines she had memorized suddenly left her. Well, at least she knew to imitate her mother, even though she got it wrong! I read about one little boy who imitated his mother and got it right, but was wrong! It seems that he visited the Zoo one day on a school field trip. He was so excited about his trip to the Zoo. When he got home, he found his Mother and with great excitement in his voice he said, “Mother, I saw a giraffe today with a neck a mile long.” She said, “Now son, I’ve told you a million times not to exaggerate.” I wonder where he learned to exaggerate? Now before we take a look in the Bible at two Mothers Worth Imitating, let me say that today’s message is for all of us. This message is not merely directed to the Mothers, it is directed to all us. God has some things to teach us FROM SOME MOTHERS, not simply TO THE MOTHERS or ABOUT SOME MOTHERS. And what He has for us today needs imitating and not like the little girl in the play: we need to get it right! So where do we look in God’s word to find some Mothers Worth Imitating? Well, a good place to start would be in 1 Samuel 1as we consider the first of two Mothers found in the Bible that are worth imitating. Now you will find more than two mothers worth imitating, in the Bible, but today we’re going to consider two of them. (1) Hannah was a Praying Mother. Hannah was not in a good marriage. In fact, she was one of two wives of a man named Elkanah (El ka nah). God’s plan from the beginning was one man + one woman for all time. By the way, that’s still God’s plan. His plan has not changed! Now, MAN may try to change it. The SUPREME COURT may try to change it. The PRESIDENT may try to change it. But God is not changing! He is the same yesterday, today and tomorrow. 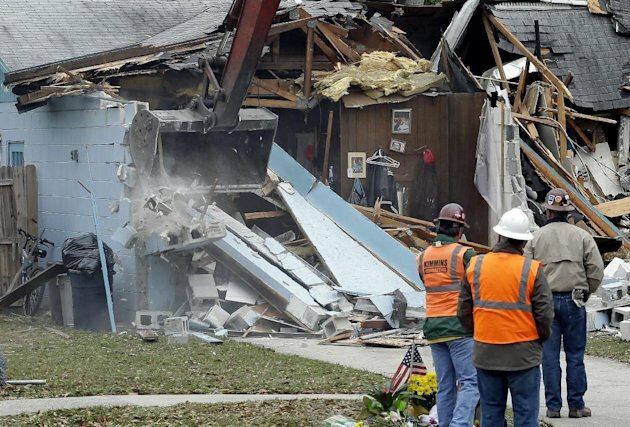 House, debris over Fla. sinkhole to be removed. SEFFNER, Fla. (AP) — Authorities hope to get a better look at a sinkhole that swallowed a man in his Florida home once demolition crews knock down the remaining walls of the house Monday and begin clearing away the debris. Crews on Sunday razed more than half the home, managing to salvage some keepsakes for family members who lived there. The opening of the sinkhole has been covered by the home, but once emergency officials and engineers can see inside it more clearly, they could begin planning how to deal with it. They also need to decide what will happen to the two homes on either side of the now-demolished house. Experts say the sinkhole has “compromised” those homes, but it’s unclear whether steps can be taken to save them. Jeremy Bush, 35, tried to save his brother, Jeff, when the earth opened up and swallowed him Thursday night. On Sunday morning, Bush and relatives prayed with a pastor as the home — where he lived with his girlfriend, Rachel Wicker; their daughter, Hannah, 2; and others — was demolished and waited for firefighters to salvage anything possible from inside. The home was owned by Leland Wicker, Rachel’s grandfather, since the 1970s. The operator of the heavy equipment worked gingerly, first taking off a front wall. 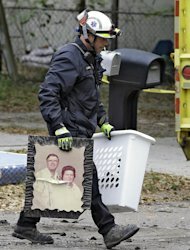 Family belongings were scooped onto the lawn gently in hopes of salvaging parts of the family’s 40-year history in the home. As of Sunday afternoon — when demolition had stopped for the day and only a few walls remained — a Bible, family photos, a jewelry box and a pink teddy bear for Hannah were among the items saved. Firefighters also were able to pick out the purse of one of the women in the home. Cheers went up from family, friends and neighbors each time something valuable was salvaged. Wanda Carter, the daughter of Leland Wicker, cradled the large family Bible in her arms. She said her mother and father had stored baptism certificates, cards and photos between the pages of that Bible over the years. “It means that God is still in control, and He knew we needed this for closure,” she said, crying. Carter said she spent from age 11 to 20 in the home, and she had to close her eyes as the home was knocked down. “Thank you for all of the memories and life it gave us,” she said. The Rev. John Martin Bell of Shoals Baptist Church said he had been with the family all morning. “We just prayed with them,” he said. He added that all five who lived in the house — Bush, Wicker, Hannah and two others ages 50 and 45 — were in need of support and prayers from the community. Several generations of family members lived in the home at the time of the ground collapse, includingJeff Bush, the man now presumed dead. Jeremy Bush tried to save his brother by jumping into the sinking dirt hole. He had to be pulled out of the still-shifting hole by a Hillsborough County Sheriff’s deputy, who was visibly shaken when talking about the incident more than a day later. “I’ve never seen anything move so fast and do so much destruction,” Deputy Douglas Duvall said. The search for Jeff Bush, 37, was called off Saturday. He was in his bedroom Thursday night in Seffner — a suburb of 8,000 people 15 miles east of downtown Tampa — when the ground opened and took him and everything else in his room. Five others in the house at the time escape unharmed as the earth crumbled. The Hillsborough County Sheriff’s Office is conducting the investigation. Detective Larry McKinnon said the sheriff’s office and the county medical examiner cannot declare Bush dead if his body is still missing. Under Florida law, Bush’s family must petition a court to declare him deceased. “Based on the circumstances, he’s presumed dead; however the official death certificate can only be issued by a judge and the family has to petition the court,” McKinnon said. The area around Seffner is known for sinkholes due to the geography of the terrain, but they are rarely deadly. No one — from longtime public safety officials to geologists — could remember an incident where a person was sucked into the earth without warning. Follow Tamara Lush on Twitter at http://twitter.com/tamaralush . Hannah Luce Walks Again After Deadly Plane Crash. After walking away as the sole survivor of a plane crash that left burns on 28 percent of her body, Hannah Luce, the daughter of Teen Mania founder Ron Luce, is back on her feet again. Luce reports that his daughter walked all the way to the visitor’s area and back without a walker on Saturday. It was the first time she’s walked over the last three weeks. A flight carrying Hannah, along with three Oral Roberts University (ORU) alumni and a former ORU instructor, was headed to Acquire The Fire in Council Bluffs, Iowa when it crashed on May 11. Luce said Hannah is encouraged by the many cards, letters and gifts. Children, he explained, have written her get-well letters. Others who’ve been through similar traumas have also written letters of encouragement. Luce expects doctors to move Hannah to a hospital/rehab center in Dallas on Monday.